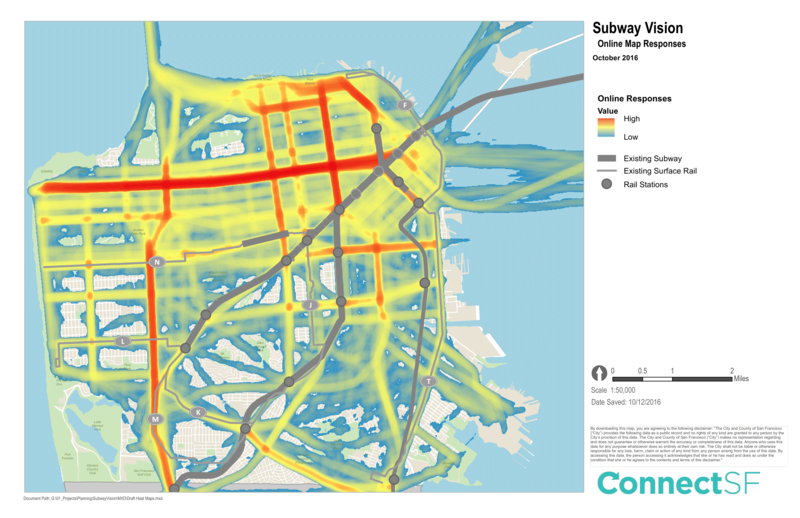 Yesterday afternoon the Land Use and Transportation Committee of the San Francisco Board of Supervisors heard a presentation from transportation officials on efforts to design a “Subway Master Plan,” a long-range blueprint for a subway network for San Francisco. Today at the Land Use and Transportation Committee, City transportation agencies delivered a presentation on their work to create a Subway Master Plan. 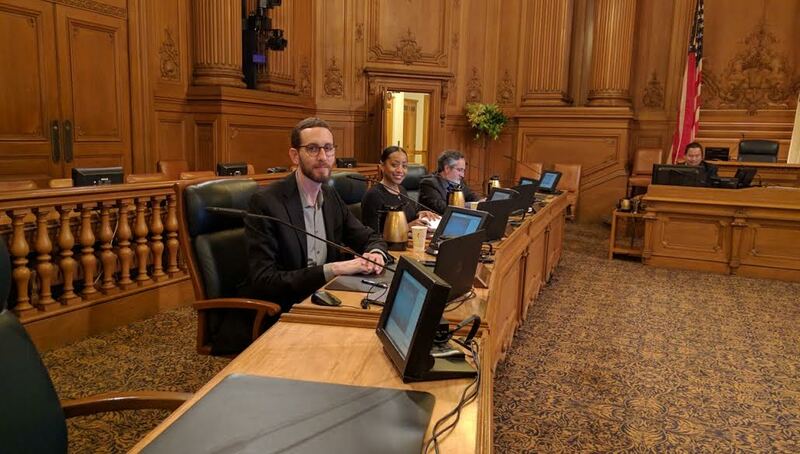 Supervisor Scott Wiener called for the development of the Subway Master Plan last year, and authored an ordinance requiring the policy be developed. At the hearing, the Municipal Transportation Agency (MTA) and the San Francisco County Transportation Authority (SFCTA) presented the initial findings – which they have called the Subway Vision — that they have been developing over the last year. So, as readers can see from the above map of the results, a Geary subway remains high on the agenda for a whole lot of people–as reflected by the thick red line running east-west on the map. Also on people’s minds is an extension of the Central Subway to the Marina, and some kind of line heading north-south on 19th Avenue. “It does not appear the heat map is as strong down to the Bayview…we will be building an enormous amount of housing, but it’s not there yet,” observed Wiener. Stokle and Straus both suggested the effort was a little too San Francisco-centric. “The next priority has to be the Caltrain DTX connection. SF has other transit—Caltrain and BART, we have to make sure all three work together well. We’re not an island,” added Stokle. Wiener seemed to take slight umbrage. “San Francisco is committed to HSR and the DTX,” he said. “I agree with the need for regional work. 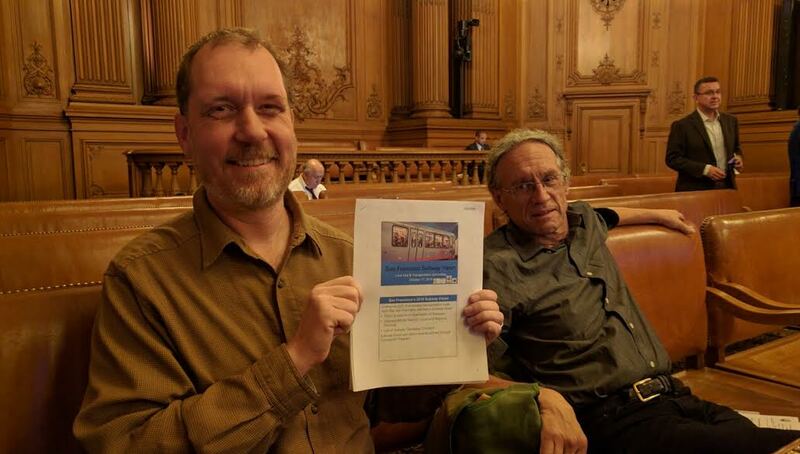 Unlike in the past we want San Francisco more engaged with our partners–BART and Caltrain matter to SF.” That said, Wiener was pleased with the “metadata” the maps provided. It’s worth noting the data also included real-world outreach at “pop-up” stations set up by the City, so the public didn’t necessarily have to use the Internet portal to participate. Digging into the data a little more, it’s clear a second Bay crossing was on the mind of quite a few participants. Streetsblog counted over forty lines drawn by participants across the Oakland Bay. However, since there’s no street grid to follow when indicating a desire for a second BART tube, the lines didn’t concentrate and form a heavy line the way they did on Geary and 19th Avenue. Additionally, it would be nice to see the map zoomed out, so that participants can continue some of these subways into Alameda and the East Bay. A couple of the speakers from the public brought up another salient point: if SF is going to go all out and spend billions on a far-flung subway system, it has to zone for the highest densities around the stations–and that’s got to mean demolishing old, low density housing and surface parking around the stations. Otherwise, what’s the point of building a subway that can carry hundreds of thousands of people to housing that’s not dense enough to justify it? And if San Francisco is going to go the all-subway route, it should look at trains that are compatible with BART or perhaps Caltrain’s coming electrified trains–both have higher speeds and more capacity than Muni’s light-rail fleet. Or, given the expense of subways, it may make more sense–at least in places–to improve surface rail routes, giving trains priority instead of having to stop at red lights for cross traffic, as they do now on so many lines. Either way, Straus was pleased at the response to the ConnectSF outreach effort. “It’s touched a nerve. San Francisco has gone from being skittish about high-capital-cost rail projects, to having a $30 to $40 billion appetite for projects,” he said. And that’s a good place to be politically. The agencies will now take more feedback and write a final report by the end of the year. Did you participate in the ConnectSF survey? If so, what do you think of the results? Comment below. First of all, you don’t know my history, where I live now, or where I lived before. Second of all, aggressive? I’m having a discussion, I haven’t been aggressive or anything. I’m being sanctimonious only in that I am being continually misrepresented here, and it’s getting a little tiresome. And, even if I am an “outsider”, people on this board should know far better than most the frustrating with not invented here syndrome. Don’t you think you can learn from how bike infrastructure is built in the Netherlands? Then why can’t you learn from the transit mistakes I’ve observed in Toronto? Honestly, you’re perpetuating the anti-transit anti-bike positions. Being pro-subways is not being anti-transit by any stretch of your vivid imagination. But OK, sure, if we were a medieval, totally flat European city with narrow streets and endless canals, run by a centralized socialized government, then maybe your idea might have some traction. I know I know right, those bike lanes which work everywhere in the world will clearly not work in *this* city right? Because *this* city is special and totally unique in every way from all other cities and can learn nothing from them. Oh wait, transit, we’re talking about transit. Changing the subject yet again? Now you want to talk about cycling in a topic about subways? But yes, San Francisco has very unique constraints based on location, topology, demographics, politics etc. And for the record, I never suggested that subways entail getting rid of buses. SFMTA could increase capacity by running more vehicles more frequently, and giving them no-nonsense priority over automobile traffic. All MUNI vehicles should be connected to a central computer and equipped with autonomous functionality, even if they have an operator. There really wouldn’t be a need to build more subways if SFMTA would just implement improvements that prioritize transit over traffic. The T line subway (using TBM) has been far less disruptive (except around station areas) than the Market St 3 level excavation. 4th St and Stockton St will not take a decade to recover. Subway construction of any kind is expensive in today’s dollars and even more expensive in 20 or 30 years when those cities that didn’t build earlier finally build. There were lots of people in the 60’s who thought BART was a white elephant and a boondoggle and would never work (original cost for the 75 mile system came in at appx $2billion). It costs almost $2billion now to dig 1 mile of subway. If close to 100,000 riders are now riding busses you can bet that a Geary subway would be well used from the beginning. Densities will increase along the line, historically that is what happened with BART and other large subway systems.